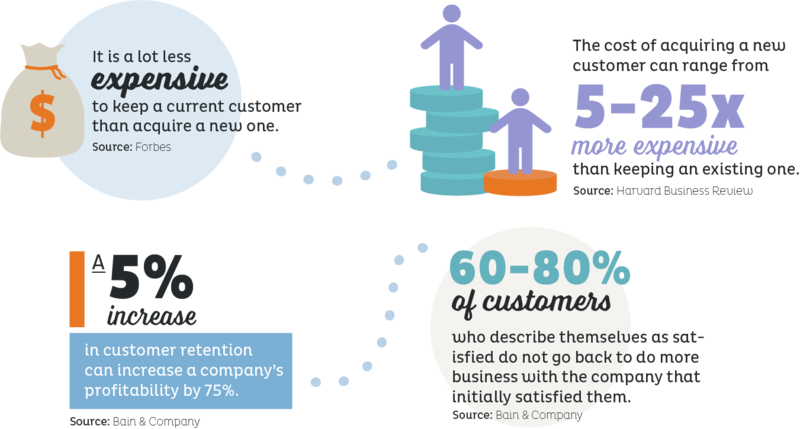 Customer retention is crucial to the success of your business. In fact, keeping a long-term customer is much less expensive than pursuing new ones. It’s no surprise that companies with higher customer retention rates are proven to have higher profits. Increasing customer retention rates start with a robust retention marketing strategy, built on continuous engagement. According to Bain & Company, 60-80% of customers who describe themselves as ‘satisfied’ do not go back to do more business with the company that initially satisfied them. This tells us one thing: that selling your product or service is not enough; it requires a strong business-to-customer relationship and continued communication between the two. Marketing automation software collects user data and tracks information about your clients’ and potential customers’ interactions with your website, emails, and social media. Most software aggregates this data, based on the user, and provides a comprehensive look at which pages they visit, which products/services they like, and what information they are seeking, regarding your company. Companies can, and should, use this data to create personal points of communication, making digital interactions feel more human and tailored to the customer, rather than appearing to be a form of generic spam from a company. As with every business, some customers are much more engaged with content than others. Data from marketing automation software makes it much easier to identify which customers are ready to buy, and who may need more nurturing, based on their interaction with your business. Marketing automation platforms continually track your customers’ behavior and assign lead scores to all your contacts, based on their online activity. Companies can set rules within the software, and assign a points system, based on the specific interactions and characteristics of their contacts, to help determine where they are in the purchasing cycle. This more precisely identifies engaged contacts and allows businesses to quickly execute marketing tactics and sales pitches for the right person at the right time. According to Laura Ramos of Forrester Research, B2B marketers who emphasize lead volume over lead quality reduce sales efficiency, increase campaign costs, and fuel the gap between sales and marketing. Marketing automation allows you to more accurately decipher who is ready to buy, helping you to target sales’ efforts more efficiently and effectively. Customer service is essential to maintaining high customer retention rates. One bad experience with your company, backed by poor customer service, could mean the end of your relationship with that customer. Most marketing automation platforms, however, record a complete history of all customer interactions, allowing you to keep track of the details and make notes concerning specific customers. Leveraging this recorded data can help you structure constructive and relevant communication, create a strong incident response strategy, and provide the highest level of customer service. This level of detail being recorded makes it very difficult for anything to fall through the cracks. One of the main reasons customers do not repeat purchase is a lack of follow-up by the providing company. Businesses run the risk of customers forgetting about their products and services if they do not maintain some form of communication with them post-purchase. A follow-up can keep your brand top-of-mind and shows consumers your company genuinely cares about them and their experience. Not all unhappy customers complain; in fact, most just switch brands and purchase from a competitor. This means that a lack of feedback is not necessarily an indication of satisfaction and reiterates the necessity of post-purchase communication. With marketing automation, you can automate follow-up emails right at the point of purchase. Most marketing automation software offers users full control over customer data fields so that emails can be framed with personal information specific to the customer’s experience, thus simplifying and streamlining the follow-up process. Continuing communication with existing customers, outside of the purchasing cycle, will also lead to higher customer retention rates, creating further impressions to help businesses remain top-of-mind, and showing customers how much they are valued. Marketing automation platforms allow the creation of customized, personal email drip campaigns to existing customers, based on their interests and interactions. Businesses can build custom-fit drip email campaigns that can be triggered by a number of customer interactions, ensuring customers feel recognized and supported at every point of their journey with a business. For example, a marketing automation platform can trigger a series of pre-written emails, based on a predetermined schedule, to a customer on the anniversary of their first purchase with that company. The final way businesses can increase their customer retention rate is to provide free value to customers, delivered via a marketing automation platform. This added value does not need to be triggered by a specific action, but merely to keep up engagement. It could be in the form of important information, such as blog articles and infographics, or special promotional items and coupon codes to encourage further spending. It is important to show customers appreciation by sending them tailored, interesting content that they are likely to interact with and find useful. Marketing automation software can help identify and track what your customers are interested in and streamline the process of sending more relatable content to your existing customers on a regular basis. Ocreative is a Gold-Level Certified Agency Partner with SharpSpring, a marketing automation platform with a powerful set of marketing and sales tools—see our certification. Sharpspring empowers sales and marketing teams to drive more leads, convert more of those leads into sales, and optimize their ROI. If this is the first time you’ve been introduced to marketing automation, it is about time you came onboard! 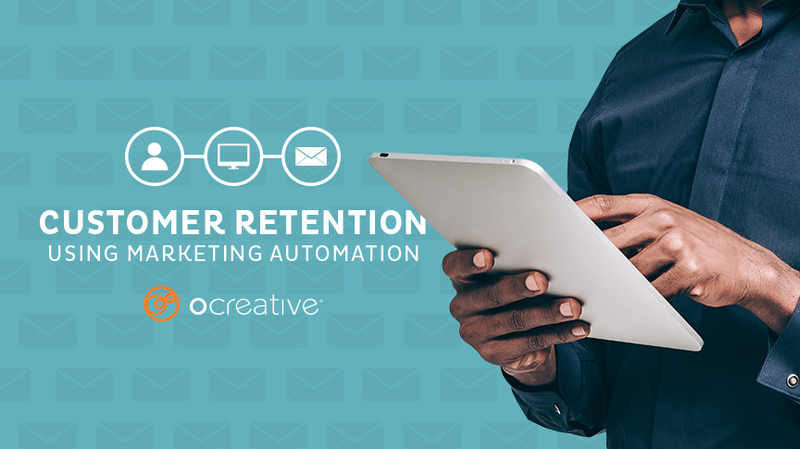 If you’ve heard of marketing automation before or are looking to explore Ocreative as your agency partner, please contact us; we will be ready to give you more information. We are happy to set up a 30-minute demonstration on how Sharpspring’s marketing automation software works, followed by a 15-minute question-and-answer session. For more information, please visit our Marketing Automation page, read our article on Lead Generation with Marketing Automation, and watch our Marketing Automation video.